While news from Africa is all too often discouraging, dominated by stories of war, famine and poverty, a recent presidential election in Ghana offered a welcome change. There, in a peaceful and credible poll, President John Agyekum Kufuor was re-elected to his post for a four-year term. Ghana was the first sub-Saharan African nation to gain independence, from Britain in 1957, but its path since then has been far from smooth. Early governments experimented with socialism and, later, Westminster-style democracy, but there were several military interventions. Today, Ghana stands as an island of stability in the generally unstable West Africa region. However, Ghana's ambassador to Washington, Fritz Kwabena Poku, says that while this is a credit to Ghana, it is not a status quo that Ghana would like to see continued. "Ghana should not be too satisfied to be an island of peace," he said. "Our destiny is linked to that of our neighbors." The ambassador said that his government's strategy is to encourage other governments in the region to adopt democratic processes and to use their resources for the benefit of the people as a whole and not just an elite class. "If other countries realize democracy is the only way to go it will be a beginning for them," he said. This lesson is one that Ghana itself seems to have learned well. "Ghanaians have realized that democracy is the only way out," the ambassador said. They would rather go to the polls than seek power through violent means. "We have come to peace with ourselves," he said. "We have realized good governance is very important for peace and stability." Interestingly, African countries have come to the point where they believe it justified to interfere in a neighbor's affairs if that neighbor clearly is engaged in major human rights violations. The right of intervention under these circumstances is included in the constitution of the African Union. The ambassador said by way of explanation: "We can't just restrict ourselves to non-intervention in other countries The African Union acknowledges the right of intervention in member countries in the face of massive abuse of human rights, genocide and war crimes." This principle has also guided policy for ECOWAS, the Economic Committee for West African States, which was set up to manage relations among West African countries. With fighting moving through the region, from Sierra Leone to Cote d'Ivoire, governments in the area have recognized that part of the problem is mercenaries ready to fight for any faction that will pay them. This ready supply of soldiers has seduced some political forces to take up arms. The ambassador said that in neighboring Cote d'Ivoire, a core issue is that citizens of nearby countries have made their way to what was once the most prosperous West African economy seeking work, and stayed on as immigrants, until expatriates now account for 50 percent of the Ivorian population. These people may have to be accommodated, and Ghana believes that the solution lies in the various parties there negotiating in good faith. Fundamentally, it (like other West African problems) is internal, and "Peace cannot be imposed from outside." Hence, "Our government is encouraging Ivorians to sit down and come to an agreement." Strengthening good government Modernizing agriculture Boosting the private sector Enhancing social services, including health and education Developing infrastructure Among the Kufuor government's achievements in its first term, the ambassador said, it stabilized the economy, brought down interest rates and increased hard currency reserves from a level sufficient to cover three weeks of imports to, by the end of 03, funds sufficient to cover four months of imports. With an unemployment rate of 20 percent and poverty of 31 percent, a top priority of the Kufuor administration is job creation, especially in the agriculture sector, which employs over half of all workers. To get young people to engage in agriculture, the government is improving infrastructure and services in rural areas. It has also encouraged more profitable ventures based on traditional agriculture, such as a program to grow Cassava and supply it to a plant in Ghana that produces industrial starch for export (rather than just exporting Cassava). The government wants to help private enterprise expand. With literacy levels already high, it has concentrated on creating practical training schemes. To provide funding for entrepreneurs, it has supported the creation of venture capital funds by banks. Ghana is also focusing on improving its climate for investment and trade. "We want a climate that is as investor-friendly as possible," said the ambassador. To this end, the government has invited both UNCTAD and the WTO to conduct investment and trade policy reviews, "to make our country as marketable and investor-friendly as possible." Ambassador Poku says that cooperation between his country and the United States has been "excellent," especially since a democratic government came to power four years ago. When the ambassador presented his credentials to President Bush late last year, Bush noted that Ghana's president was also seeking re-election through a democratic process. An Investment and Trade Agreement between Ghana and the United States has proved a successful framework for US assistance, and Ghana is one of 16 nations to qualify for funding from the Millennium Challenge Corporation. It will get assistance from MCC from the 04 and 05 budgets. The ambassador said American assistance for regional peace is effective, including Washington's support for the ACOTA program to train peacekeepers. Ghana has been supplanted by Cote d'Ivoire as the world's leading cocoa producer, but its production of this crop is increasing (700,000 tons last season) and remains an important export. Ambassador Poku said among his tasks is to demonstrate to jittery US companies that cocoa from Ghana is produced without child labor or other unacceptable abuses. To strengthen Ghana's case, he has visited Hershey in Pennsylvania, a buyer of Ghana cocoa, and worked out how to certify the quality and proper production methods of Ghana's cocoa. The ambassador has made several forays outside Washington, and believes, "You must go beyond the Beltway to see what America is all about." Among his more interesting trips has been one to the Navaho Nation in Arizona, where he examined how the Indians there use modern technology to improve the quality of their lives, with an eye to duplicating their success in Ghana. Fritz Kwabena Poku assumed duty as Ghana's Ambassador to the United States (with concurrent accreditation to Mexico, Guatemala, Belize, Haiti and Bahamas) at the end of July 2004. A career diplomat with over thirty years experience in diplomatic practice in Africa, Europe and America, the 59 year old bi-lingual, who is also a Barrister-at-Law, has extensive experience in bilateral and multilateral diplomatic practice. Until he assumed post in the United States, Fritz K. Poku served as Ambassador and Permanent Representative to the Ghana Permanent Mission to the United Nations and other International Organizations such as the World Trade Organization (WTO) in Geneva, Switzerland, the International Atomic Energy Agency (IAEA) and the United Nations Industrial Development Organization (UNIDO) in Vienna, Austria. In addition, he was also accredited to the Federal Authorities of the Swiss Confederation and the Federal Government of Austria. For about a year and a half, Fritz K. Poku was Ambassador to Ethiopia and the Permanent Representative of Ghana to the Organization of African Unity (OAU) now the African Union (AU) and the United Nations Economic Commission for Africa (ECA). Concurrent accredited countries to this position included Tanzania, Uganda, Kenya, Rwanda, Burundi, Djibouti and Eritrea. Ambassador Poku has served on many important delegations. He was a member of ministerial delegations to meetings and conferences of the British Commonwealth, the United Nations, the African Union and ECOWAS and has served in various capacities in his diplomatic career. Before his appointment, Ambassador Poku had served in Cote D' Ivoire, Sierra Leone and Switzerland. When not assigned to a post abroad, Ambassador Poku served in Ghana's Ministry of Foreign Affairs, which he first joined in 1970. 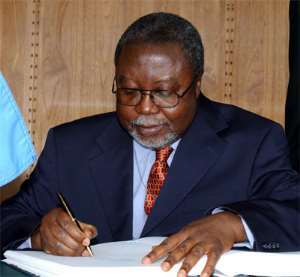 He passed through the mill as Desk Officer of Economic Relations and the Africa and OAU Bureau respectively and rose to be Director in various sections including Director of International Organizations and Conferences(1996-97) at the time the United Nations Secretary -General Kofi Annan was elected; Supervising Director of Policy Planning; Research and Protocol, Information and Culture. His last position in the Ministry was Chief of Protocol from 1998-2000. Fritz Kwabena Poku obtained his Ordinary level and Advanced level certificates from one of Ghana's Ivy League Colleges, Adisadel College, and later enrolled at the University of Ghana in 1966 where he graduated with Honors in French. He obtained a Certificate for French Studies and Civilization at the University of Abidjan in La Côte D'Ivoire in 1969 before studying at the Ghana Institute of Public Administration and Management (GIMPA) for a Diploma in Public Administration. Additionally, he obtained a Qualifying Certificate in Law from the University of Ghana, then proceeded to the Ghana School of Law to become a Barrister at Law. He was called to the Ghana Bar in 1983. Ambassador Fritz Kwabena Poku is married with four children.